FRENCH CHAMPIONS MONACO raided Serie A to sign Senegal forward Keita Balde from Lazio on Tuesday, having earlier bought Montenegrin international striker Stevan Jovetic from Inter Milan. 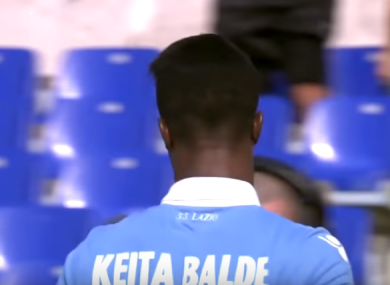 Balde, 22, who has made 12 international appearances, joined on a five-year deal for a reported €30 million after impressing with 16 goals in the Italian top flight last season, despite making only 21 starts. “I’m very happy to be signing for AS Monaco, a club with a great history,” he said. The 27-year-old Montenegro captain Jovetic is set to inherit the number 10 shirt worn by Kylian Mbappe, with the teen sensation’s mega-money move to Paris Saint-Germain expected imminently. Jovetic, who has signed a four-year deal with Leonardo Jardim’s men, started out with Partizan Belgrade before joining Serie A side Fiorentina. He had a spell with Manchester City and was loaned out by Inter to Sevilla last season. He has developed in the big leagues and has experience at the highest level,” said Monaco vice-president Vadim Vasilyev. Email “Monaco pay €30 million for Lazio star to help fill Mbappe void”. Feedback on “Monaco pay €30 million for Lazio star to help fill Mbappe void”.